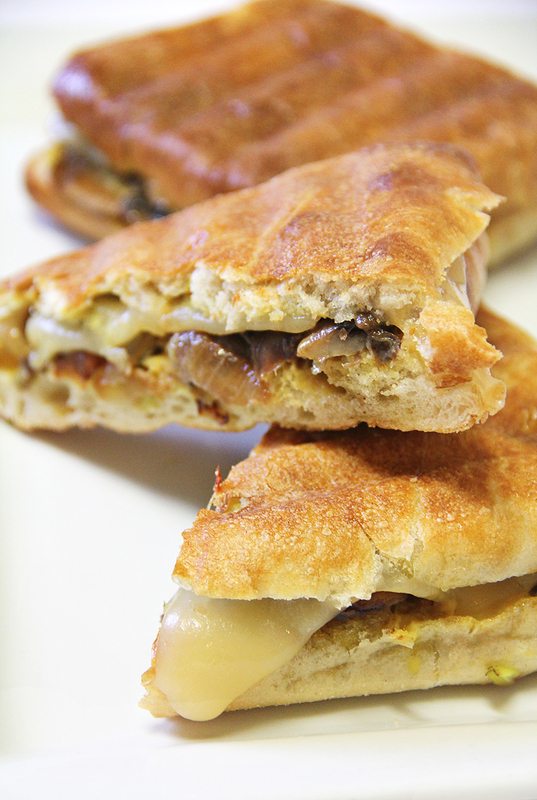 If you are looking for a quick hot lunch or a comforting sandwich to pair with dinner, this panini, packed with baby bella mushrooms, gooey swiss cheese, and sweet sauteed onions is a fantastic choice. I needed to make something fairly quick for lunch and since I still have 97 things left to check off my to-do list for the day, this worked out perfect. It took 20 minutes to make from start to finish and 2 minutes to eat.. While the onions & mushrooms were cooking, I started prepping the sandwiches and heating the panini press. 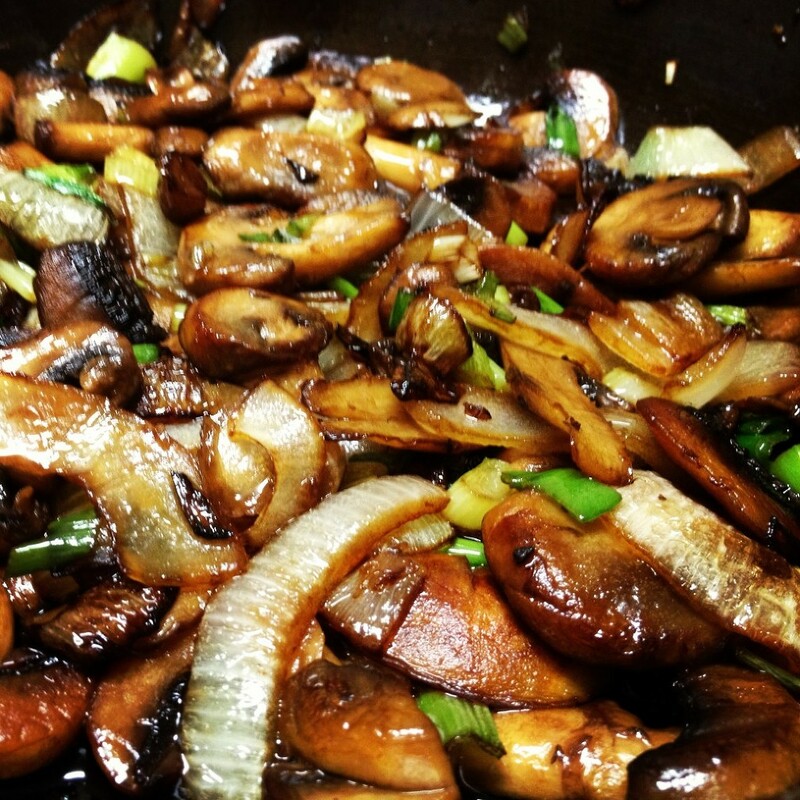 I sautéed the mushrooms & onions separately and then added them back to the pan to heat together at the end. 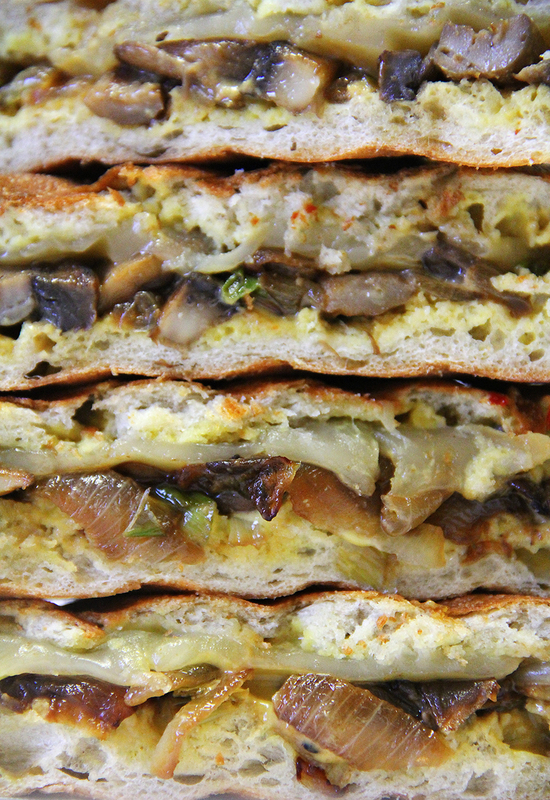 up-close & personal.. Panini’s are “pressed” sandwiches that can be filled with anything you’d like. This vegetarian version will satisfy even the biggest of meat-eaters.. I LOVE Ciabatta bread for Panini’s. The outside gets crunchy while the inside stays soft. It is the perfect bread choice for any “pressed” sandwich. Place 2 tablespoons olive oil into a sauté pan over medium-low heat. Add onions. Season with salt and add sugar. Continue cooking, stirring as necessary until onions have caramelized (appx. 15 min) Set aside. Add the remaining 2 tablespoons olive oil to another pan over medium heat. Add mushrooms. Cook for approximately 4-5 minutes. Add the caramelized onion and stir in scallions. Remove from heat. Heat your Panini press. 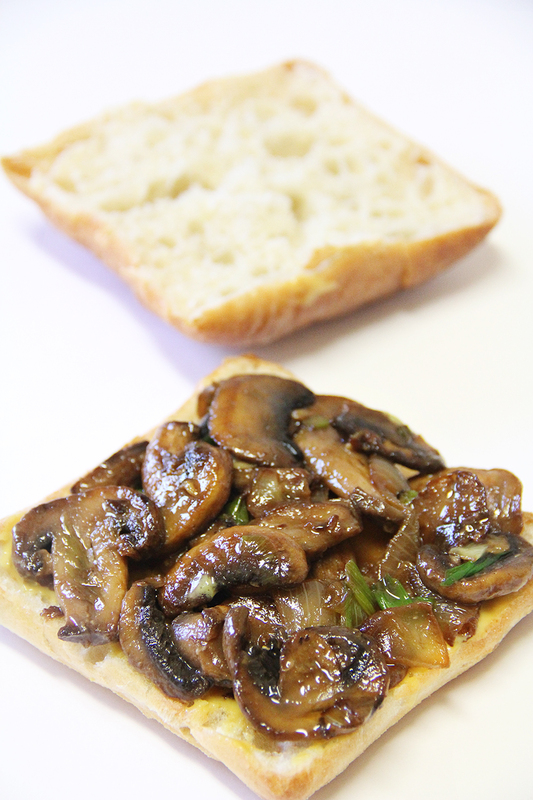 Spread each ciabatta with 1 tablespoon of dijon mustard and distribute mushroom onion mixture between two slices of bread. Place 2 slices of Swiss cheese on each piece of bread. Lightly brush tops of bread with olive oil. 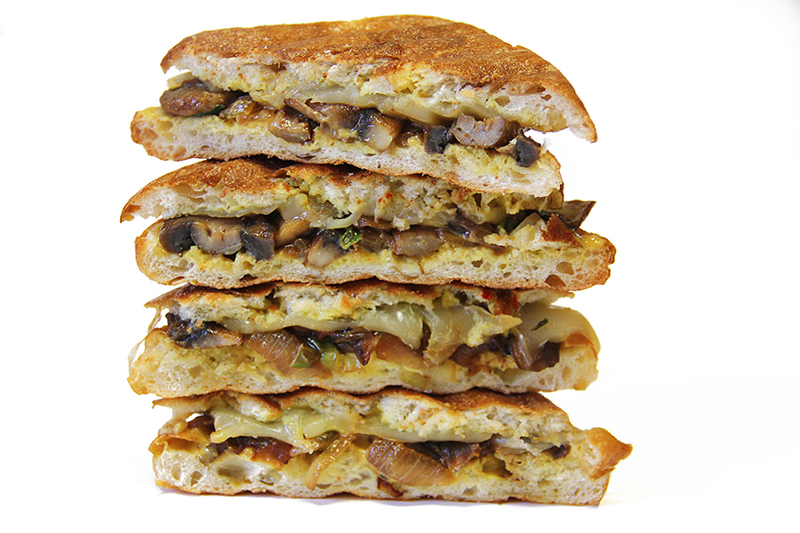 Place sandwiches onto hot panini press. Cook for approximately 4-5 minutes until bread is toasted and cheese has melted. If you don't have a panini press, you can use a cast iron skillet with a foiled covered brick or a george forman grill works great too. 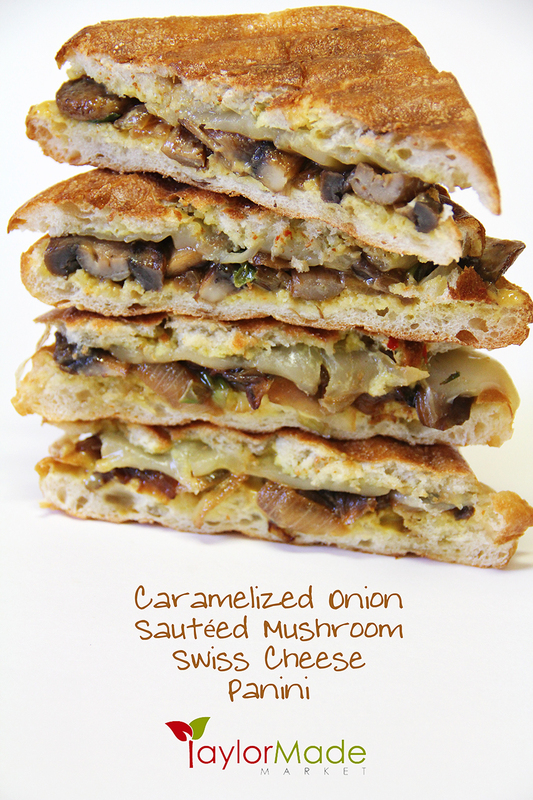 Caramelized Onions, Sautéed Mushrooms, scallions, swiss cheese, dijon on ciabatta bread pressed until crispy on the outside and ooey-gooey melted cheesy goodness on the inside.